MMS JULY 2018 82 mmsonline.com MACHINING TECHNOLOGY to prevent the spindle from hitting the fixturing device. To minimize the chance of vibration from tools sticking out far from the toolholder, the shop uses balanced shrink-fit and hydraulic toolholders that provide higher clamping force. 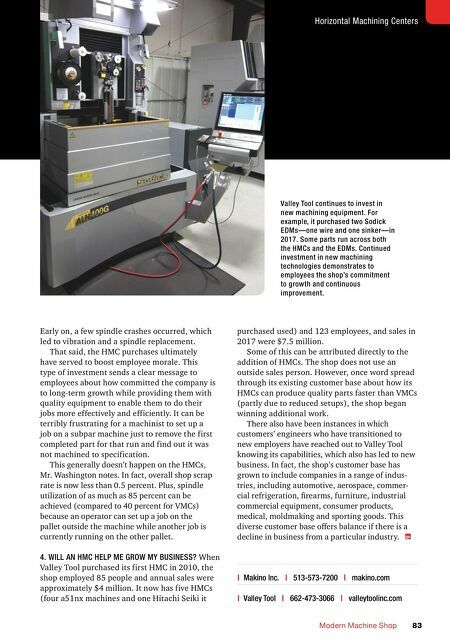 In some cases, Valley Tool is also considering higher-end tools to take advantage of the machine's higher rigidity to further increase speeds and feeds. Because the HMCs have 60-station automatic tool changers (ATCs), they can load multiple tools for upcoming jobs. The shop also loads redundant tools for long-running jobs. On-machine laser probes can automatically calculate tool offsets, while touch- trigger probes are sometimes used to validate machining processes. Valley Tool also uses hydraulically actuated tombstone clamping devices on two of its HMCs. These particular machines are dedicated to specific jobs, and the hydraulic clamping simplifies part loading for operators and minimizes the chance for work-related injuries. This workholding tech- nology also provides more consistent clamping pressures and part-holding repeatability. 3. HOW WILL AN HMC PURCHASE AFFECT MY EMPLOYEES? Mr. Washington says that there was a three- to six-month learning curve for the programmers and operators who had no prior experience with HMCs. This involved on-site training as well as training for some employees at Makino's Mason, Ohio, headquarters. Some of that learning curve was rethinking how existing VMC work might be fixtured differently on an HMC and how to take advantage of the HMC's fourth-axis rotation to reduce setups and perform contouring operations. Also, while an operator can typically see how a tool is engaging with the workpiece on a VMC, an HMC's tombstone or other fixturing device can sometimes obscure the cutting operation. This can make some operators uneasy at first, but they ultimately come to trust the process. Plus, off line simulation for new programs are performed before those jobs run to help prevent collisions. One thing Mr. Washington might have done differently is not rushing to get that first HMC producing parts before employees had time to get acquainted with the new machining platform. This type of investment sends a clear message to employees about how committed the company is to long-term growth while providing them with quality equipment to enable them to do their jobs more effectively and efficiently. Valley Tool also assembles, anodizes (via an outside vendor), laser etches, packages and drop ships the handlebar mounts its customer. It typically ships 100 mounts per week, although that number is expected to increase because the product is still relatively new.